Lecture Theatres are where education comes to life. Universities and colleges across the country relying on them to deliver valuable information to vast numbers of students in any given day. Making sure these masses of learners are comfortable is extremely important, especially considering how important being comfortable is to learning. This is why we take so much care in selecting the correct lecture theatre seating for each venue. If you have Lecture Theatre Seating that is uncomfortable, this can cause distractions and mean the students do not take in the required information. Fidgeting and constant shuffling of position in an attempt to get comfortable is an annoyance for the student, those around them and the person giving the lecture, which is why many universities invest a lot of time on furnishings, ensuring they select the correct lecture theatre seating for their students. 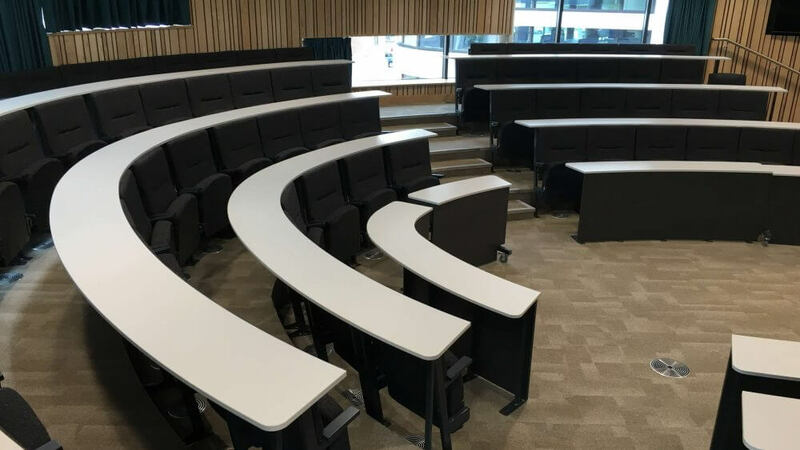 There are plenty of varieties of Lecture Theatre Seating, whether it’s a super comfortable variety with individual writing tables or a bench-type with a long all-in-one desk running along the row, each one has it’s own purpose and use. Once the kind of Lecture Theatre Seating is decided, the next step to creating an optimum learning environment is to figure out the layout. Depending on the size of the theatre, you may opt for the traditional layout of tiered seating with a stage or lectern at the front. Alternatively, if the venue is smaller, a more intimate style may be appropriate. Often lecterns are placed to the side of the theatre, to account for modern technology and slideshows being an integral part of how the lecture is given. Many universities are now opting for more modern style layouts when selecting their lecture theatre seating, including our popular Harvard arrangement. These are often in smaller lecture halls with curved seating benches which include power outlets and full length modesty panels. This offers a contrast to the traditional front and centre lectern stereo-typically associated with lecture halls. The overall layout and choice of Lecture Theatre Seating can also depend on the subject matter. If the theatre is being designed for a subject such as philosophy or psychology where debate is likely, it is advantageous for the theatre to be smaller and more intimate to encourage debate and allow discussion to flow freely; whereas a subject such as Mathematics could be delivered in a larger theatre to more people as there is less likely to be discussion. Get these factors right, from the layout to Lecture Theatre Seating, and you can create the perfect, comfortable environment for the leaders of tomorrow to learn in today. 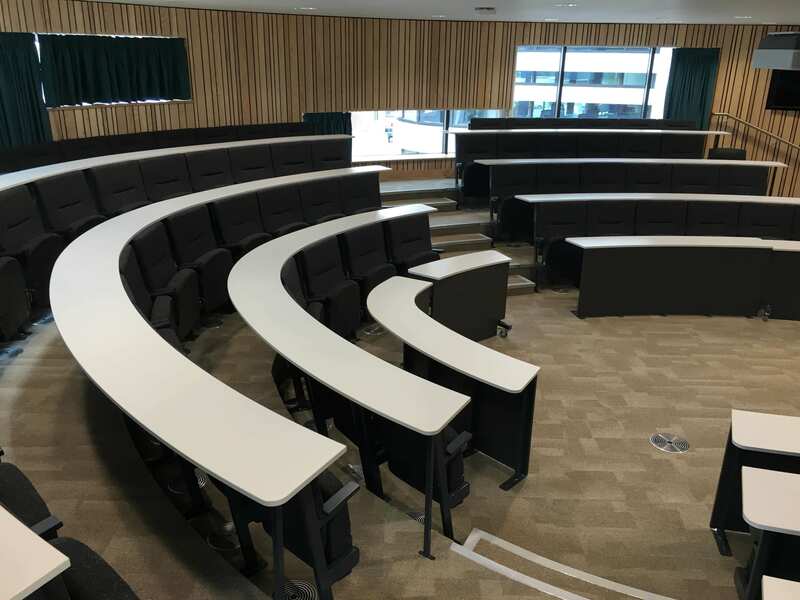 Take a look at the new “Interactive” Lecture Theatre Seating we have installed at Sheffield Hallam University’s brand new Charles Street Building.